We like to name things. We name our children, of course, so we can tell them apart. That way we know who’s due for a check-up at the dentist and which one kicked the soccer ball through the neighbor’s window. Also, when teachers tell us what a pleasure it is to have them in their class, having a name helps us verify that we’re talking about the same kid. We also name our pets, our boats, and even our cars. If you’re wealthy you may give a name to your home, something like The Sycamores or Rosefield. We name distant stars, screwdrivers, long-extinct animals, golf clubs, and every square inch of the human skull, as well as the tiniest insects and the even tinier bacteria found inside their bodies. The Japanese have dozens of words to describe subtle differences among the various kinds of sumo wrestling moves, so while you and I may just see two big guys pushing and slapping each other, they see nuance and technique. We even feel compelled to assign labels to things that no longer exist. About 225 million years ago, according to geologists, all the continents were connected in one giant landmass called Pangaea. Actually, it’s hard to be certain what it was called, because there weren’t any people around then, and maps hadn’t been invented yet. In fact, there would have been no need for it to be called anything. But then in 1912, along came Alfred Wegener, a German geophysicist who theorized that the continents sit on giant plates, which drift around on the Earth’s crust. He coined the word Pangaea from two Greek roots; it means all lands. As if this wasn’t presumptuous enough, Wegener also claimed that Pangaea later divided to form two smaller continents, which he named Laurasia and Gondwanaland. As the plates shifted, the land continued to break apart, and the seven continents gradually moved into their present positions, along with thousands of islands. Wegener was a brave guy and took a lot of heat for his theory. Most scientists in the early twentieth century thought he was out of his mind, but he refused to back down. I respect him for that. On the other hand, he’s been dead for eighty-two years, and while his ideas are now widely accepted, it’s time someone challenged those names he selected. I realize this argument is pointless, but that’s exactly the kind of discussion I prefer, because you can take any position and nobody really cares enough to disagree. If I’m on line at the post office and I turn to the person behind me and ask, “What do you think of the name Pangaea?” they’re likely to say, “Is it a boy, or a girl?” And then I say, “No, no, it isn’t a baby. I’m talking about the super-continent that existed a quarter of a billion years ago. It eventually split into two pieces, and Alfred Wegener decided, completely on his own, to call them Laurasia and Gondwanaland. Isn’t that horrible?” By now, the other person is racking his brains and trying to concoct a valid reason to bolt from the building. Meanwhile, he pretends to be interested in the shipping boxes and padded envelopes the post office has for sale. As I said, no one cares about Pangaea. And yet, it’s the homeland of everyone who’s ever lived, and in that light it deserves a better name. So I’ve chosen to call the ancient super-continent Extravaganzia. Isn’t that better? You may have noticed that all of the continents’ names end in the letter A, except for Europe; I suspect that was a typing error made by someone in the atlas business, probably either Rand or McNally. In order to help you visualize what the place looked like, I’ve drawn my version of Extravaganzia (see Figure 1), surrounded by a super-ocean. (Everything back then was considered “super.” This is the first known example of marketing hype.) The single body of water is shown in a bright magenta, which I believe was its real color. I call it the Enormic Ocean. I’ve included the name of this global sea in my diagram, and even put a lot of space between the letters, the way they do on real maps. Cartographers add that extra letterspacing as a way of letting you know that something is big and spread out, and that they have no idea where the edges are. This is especially true of oceans, which flow into each other and don’t have definite boundaries. If you’ve ever been on a boat and wondered why you never see a sign that says, “Welcome to the Atlantic Ocean,” that’s the reason. I sometimes wish Extravaganzia hadn’t separated. For one thing, with the land intact it would have been much easier to travel to Europe. If you lived in New Jersey, for example, and wanted to visit Spain, you could have walked there. By bus, it would have been maybe a half hour, and that’s with the tolls. But the best part would have been that you could have driven your car anywhere in the world, even to Lichtenstein, which was once an island west of South America. In a catastrophic event that scientists have not yet begun to explain, mostly because they’ve never heard of it, this diminutive speck of land was hurled hundreds of miles into the air and fell into its present position between Switzerland and Austria. For sure, that would not have been a good day to be motoring around Zurich. And there’s no denying that living on a super-continent would have presented other drawbacks. You wouldn’t have wanted to be in central Africa and suffering from claustrophobia. Prices for waterfront property would have been even more ridiculous than they are now. Kangaroos would be everywhere. But the advantages would have been just as numerous. We’d have fewer time zones to deal with, and far fewer national anthems to endure. We sure wouldn’t need the seven thousand languages that are spoken today, and could probably get away with four or five. The Olympics would be convenient for everybody. Humans could avoid extreme weather by migrating north and south as a group. And we’d have intriguing mixtures of regional dialects — French, for example, would be tinged with a Boston accent, and that couldn’t help but be entertaining. Alfred Wegener was born in 1880, nine years after the unification of Germany. He died in 1930, so he didn’t live to see the division of his country after the second world war, or its reunification a decade ago. In other words, he missed all of the pivotal moments. According to current theory, the continents will re-assemble in about 250 million years. We weren’t here for the big split, and it doesn’t seem likely any of us will be around to see the get-together, either. But it’s certain that by then, there will be many more things that need names. And with any luck, the super-continent itself will be called Extravaganzia. Or maybe Extralargia. Or Stupendia. Anything that ends in the letter A. Well, almost anything. NOTE: As my friend Sandra Parsons points out in her comment, below, German reunification was more than two decades ago. Yikes. Time for my nap. This was hysterical! Loved it!! Thanks, snydeen. Coming from a self-described romantic comedy nerd, that’s welcome praise. Thank you, Hema. Congratulations on getting the Illuminating Blogger Award, and for the recent one-year anniversary of your blog. I will never look at a map or globe the same again. I guess at some point the map and globe companies will have to revise all of their products. I hadn’t thought of that. Maybe someone will invent a globe with continents that slide around. Hysterical as always. Thanks for the laugh. My hubster is very fond of telling me and everyone around us that he is soooooo glad America was named after Amerigo Vespucci’s first name not his last. Can you imagine living in Vespucciland? I doubt Ray Charles would have ever agreed to sing Vespucciland the Beautiful. But it has a spectacularia sound to it! Ooh. Yeah. Sorry about my reaction at the post office…but uh, to name your kid Laurasia is just plain wrong. I really wish I could stick around here a few 100 million years when everything comes back together again. I am dying to go see Italy one day, but I hate to fly, I’d much rather get there with a quick hop, skip and a jump. You never know, Darla. Maine could snap off and float out to see all by itself. If you really want to see Italy, it might be better not to wait. I’m not sure where the UK is in that mess of a map. Could still be a long trip. I hope you’re doing well, Teresa. What a timely topic, Charles! Just last night, I was at dinner with some colleagues, one of whom spoke of having given a name to her dissertation because the word “Dissertation” causes angst and stress. So she named it “Rainbow.” I love the idea! Now I need to come up with a name for my dissertation. Something that will make me feel relaxed when I say it. Something that sounds pleasant, both to hear and to say. Please feel free to make suggestions. 🙂 Thanks for another fun read! The word that came to mind was cheesecake. But then, it usually does. As someone who names all sorts of things, I understand this need to… er… name all sorts of things. 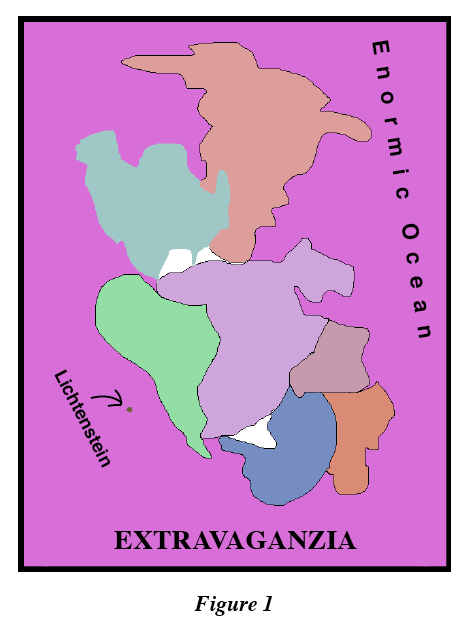 I like the idea (and name) of Extravanzia and I was interested to learn why Lichtenstein is where it is. I wonder where it will be, next? Probably at the bottom of a well that future archeologists dig up (the ones that went back to the planet earthia from differentplaneta). I love Extravaganzia as a name. I may change my name to Extravaganzia – the only problem is that it would make my initials E.R. (Extravaganzia Rainsford) and might mean people come to me with their injuries. Which would be a mistake for them as I am a bit squeamish. Maybe if I added my middle initial – A – OK but then I’d be E.A.R. I might need to change that too. So while I’m working on my middle name (how about Clytemnestra?) can we do a swap? I think Hyperbole is a better name (rhymes with Olé and Hay and other easy to rhyme words if you needed to include it in a poem – try rhyming Extravaganzia). It is, overall an amazingly, brilliantly, wonderfully, fantastic name for a unicontinent (which looks so much like incontinent I am now wondering why they are called continents in the first place, when not even one of them is contained in any demure sense of the word). Trisha, I think if you changed your name to Extravaganzia, you’d spend half your life having to spell it for people, slowly and more than once. Plus, there would never be enough boxes on those application forms, and you’d end up with Extravaganz. Thank you for the great comment. It could be a post of its own. This is hilarious! Although I knew about continental drift, I didn’t know the names. Gargantua — that would have been a perfect name for the original continent. Is it too late to change my mind? It’s never too late! Hahaha! You should update Wikipedia! I am partial to extravaganzia and I bet McNally was responsible for the typo. I just read that in 1920, Rand McNally started publishing road maps that were given away for free at Gulf Oil’s gas stations. The idea was that the maps would encourage people to do more driving — and buy more gasoline. I guess the boys were pretty smart after all. Hey, my house has a name and I am most definitely not rich. My son named a toad that runs wild in our yard. Every year he finds Toby and everytime my husband forced him to let Toby roam free. Does your house really have a name, Rumbly? Did you name it? If it’s already named when you buy it, are you allowed to change the name? Toby is a good name for a toad. Don’t change that. I named our house “Rumbly Cottage” and painted the name on the door frame. Whoever buys it from us in the distant future might have to change the name. Oh dear. What a wonderful detour from today’s self-imposed writing assignment. I love the levity of your posts. Have you ever done stand-up comedy? Well…I’m sure you haven’t because writers just don’t. But I’d actually pay to see it, if you did it. I’ve done stand-up in my head. It’s much easier in there, and I kill every time. Hilariousia. What have I started? And it’s out of control, now. Here is a bit of my vast and useless knowledge. In German, Europe is called Europa (pronounced Oi-ro-pah), in Russian it’s Yevropa (don’t forget to roll the “r”), and in Spanish Europa (A-u-ro-pah). So I don’t reckon it was a typo but rather the misguided attempt of some Anglo-Saxon scholars to distinguish themselves from their Saxon savage ancestry. Oh, and at the risk of sounding like a terrible know-it-all, the reunification was actually more than TWO decades ago. I know, time just flies when you’re having fun, doesn’t it? And I sure had that reading your deep and relevant thoughts. Thanks. I did think of Europa, Sandra, because that’s what it’s called in Italian, too. I still wonder where that tendency came from to end the names of continents with the letter A. Thanks for correcting me, but I’m pretty sure it’s a hopeless case. You know, Zeus also doesn’t handle criticism well. Thanks, Bruce. 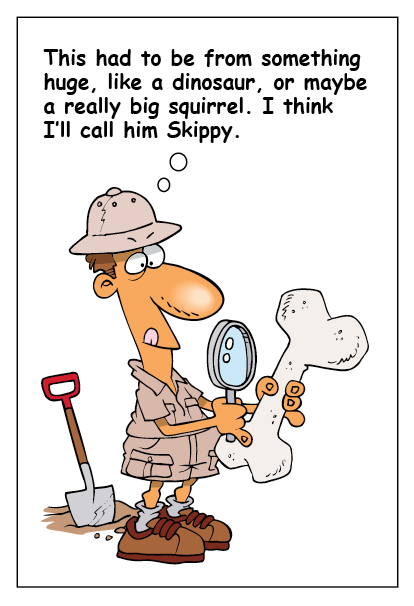 The cartoons are fun to do, especially because Ron Leishman’s original artwork is so great. Thank you, Buckwheat. I can always count on you to say something nice. Ummmmmm..Europe isn’t a continent. It’s ON a continent, the Asian one. Gondwana was named that because its core continent was…and is…the African craton. South America, Antarctica, Australia and India were all attached to the African craton. Gondwana refers to the first modern humans, Homo Sapiens. They used to be called “bushmen”, now they’re known by their tribal names, San and !Kung. Laurasia broke up into places we now call Asia, (or Eurasia, as you prefer), Siberia, North America, Greenland, England, Iceland, etc. All the continents still exist, by the way. I still think of Europe as a continent. True, Eurasia is one continuous landmass, but you could just as easily say Asia isn’t a continent, and that it’s part of Europe. I also still think Pluto is a planet. And tomatoes are vegetables. Thank you for all of that information. I didn’t know anything about Gondwana, including its reference to early humans. But I did know that the continents still exist. Loved reading this. You’re clearly not only very smart but also extremely witty! I hope one day we see the use of Extravaganzia. Perhaps not us … but those who will be around after we have all gone. New to your blog. WILL be sticking around, keep up the good work! I like your name. Have you started a blog? It looks great. Keep it going. Gondwanaland… that is precisely why I don’t read science fiction .. EVER … but Extravaganzia… that’s exactly why I love your blog! Who but you would ever write on this topic? I’m so happy you’re with an audience that adores you, and not frightening people in the line at the post office! Gondwanaland is actually a real name given to the continental landmass supposed to exist millions of years ago. It is unique sounding and a tonguetwister. And possibly scientific-palaeogeographic fiction. I’ve almost stopped going to the post office, Betty. I never get any mail. Seriously. And when I do go, no one talks. It could be fiction, inveterate. But there is some pretty compelling evidence. Another hilarious and enjoyable post! Only, I hope I don’t run into you at the post office when I’m in a rush! If you do, I hope it’s in Switzerland. I feel like I’ve just read a synopsis for a Michael Crichton novel. I was convinced that “Congo” was scientifically accurate until I read that he made much of it up. Still … like your story … maybe. When reunification happens, will there be a big party. I do love parties … and, Charles, I love your post. There will be a huge party, Judy, and everyone should get their invitations on the same day. This is one of the cleverest things I’ve read. I have to admit I kind of like Extralargia but all of the names are good. I’m sad that I won’t be around to see reunification because I would enjoy seeing kangaroos everywhere. Although I’m not sure I’m ready for Boston-tinged French. I doubt the continents will reconnect to form the exact same landmass, unless it all runs on some kind of conveyor belt system. So Boston will probably end up somewhere else — maybe near Shanghai. That would be even better, I think, don’t you? The space between the letters of the names of various seas and oceans on maps… OMG! you are so observant! Who observes that??!! People who lack focus and direction, that’s who. I know I’ve asked you this before, but is there any way you can publish your posts in both German and English? Too much work? Thanks, Allyson. You take care, too. I imagine there will always be islands, even after things crunch back together. Maybe you could claim the Isle of Person for yourself. I’m not sure I could get used to cats without tails. Pangaea, Lichtenstein, Extravaganzia, Gondwanaland.. Woo, you gave my tongue a “super” workout there, Charles. Even the surname Wegener had been challenging for me. I’m kind of relieved you didn’t name the colossal ocean “engulfic ocean” or “enemic” ocean. I agree. Granting continents re-assemble today, the advantages undeniably get to surpass the disadvantages. Kangaroos jumping everywhere would be uproarious. There’s a chance too I could drop by your house on foot for some tea. Wow. Marj, I have no doubt that even if the continents were to re-converge, humans would create just as many artificial boundaries as there are now. We seem to have a need to separate the world into Us and Them. I don’t really like tea. How about lemonade? Whatever it is, I hope to be on the side of the boundary where you belong. Always. Lemonade would be just fine. Thank you for all your kindness, Charles. Please don’t go changing the names of anything yet. 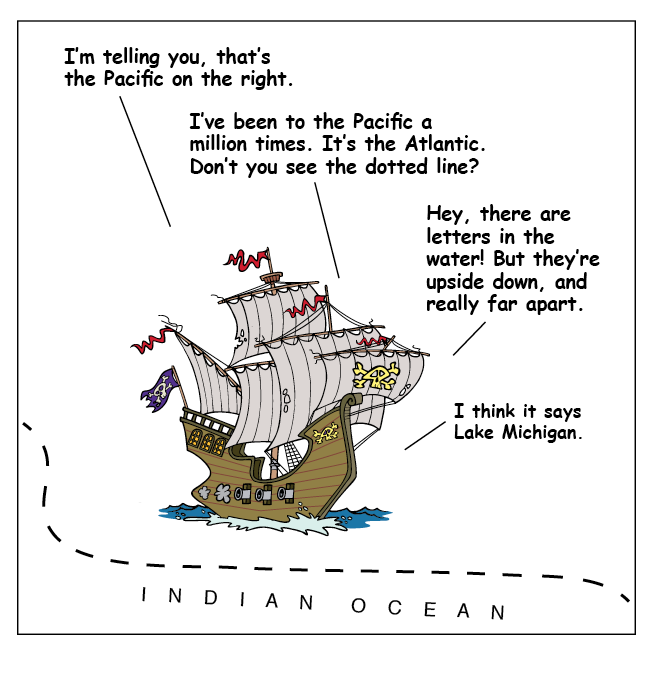 It took me years to remember which was the Atlantic and which was the Pacific ocean. And then there was all that fuss going on with the USSR and those other countries within it – well, let’s just leave geography alone for awhile. Heck, what with global warming, we’ll probably end up with just one body of water. Lots of docksides for everyone. Sad and scary. There will still be plenty of land for everyone, SDS — assuming the celebrity environmentalists are willing to give up their twenty-thousand-square-foot mansions. But that doesn’t seem likely. I myself at times wonder who kept all these names and how did they even decide on one ? I’ve always wondered about names for big places. Like Earth, for example. Who got to decide that? Or the Milky Way, which is really big. Gondwanaland? Are you sure J.K. Rowlings wasn’t the one doing the naming? Hilarious and true. We do love to create nice tags for our stuff. My daughter named her harp. Her harp! “Evangeline” to match the angelic, dulcet tones. A Frenchie with a Bostonian accent would be most amusing! Love your blog and added it to my blogroll to pass on the fun. At least your daughter came up with an appropriate name for her harp. A perfect name, actually. Thanks for your kind words, Maria. And congratulations on your new blog. Thank you, and congratulations on getting the award yourself. It was well deserved. Is it too late to wish you a happy birthday? Wonderful! Gee, had the continents stayed “stuck” together, I might not have had such a hard time in Geography. Oh, and Pangaea is bad for a baby name, but I dare say, Placenta is worse. Your blog, however, is pure delight! I appreciate your consistent support, Ashley. And I loved this post about your mother-in-law. I hope your family is doing well. Linda, I wouldn’t be surprised if Texas refuses to join the Big Slam, and floats off by itself to form its own continent. If so, I hope it finds a spot with gentle breezes, and just enough rain. An astute intellectualosia unscrambled the secrets of the planetaria. Whatever anyone calls it won’t matter because nobody I know can remember names anyway! On the positive side, we’ll have 250 million years to work on it. I haven’t visited your blog in far too long and for a while I felt like something was missing. Then I came here and realized what it was, I was missing the joy and laughter I get from reading your posts. I’ve often wondered why there is no “Welcome to the Atlantic Ocean” sign, so thank you for explaining it to me. And I would love to hear French with a Boston accent. I think it would be about the best thing ever. It occurred to me just yesterday that we’ve been out of touch for quite a while, so I went over to your blog to see what was happening. I was going to send you an email, but decided against it. We all go through these cycles of being so busy we can’t seem to catch up with ourselves. I was hoping that was the case with you, and I’m very glad to get your comment. How are things in your corner of the North American continent? Things are going very well. I’m about to go on holidays and when I get back, I’ll get back to posting. And you can always send me an email. I’m always happy to hear from you. I hope things are well with you, too. Good stuff. For whatever it’s worth, Miles Davis recorded a live album in 1975 called Pangaea, the second track is Gondwana which is 46 minutes long. I didn’t know that, Ribbie. Any idea why he chose those names for the music? Love this! Someone who knows cool facts and is funny. I tried to do a Boston/French accent to myself, and I couldn’t really do it, though if anyone in the library noticed me doing it they probably thought I was deranged. And of course, I had to go through all the continents, and Europe is the odd ball. Then again, Australia is a nation and a continent, which is also weird. I couldn’t do the Boston-French accent either, but I’ll keep trying if you will. Thanks for the nice comment, and I hope you’ll keep reading. Reblogged this on Cess Katisya. I think cool names are the first step to an intergalactic tourist destination. Who would pay to visit Extravaganzia? I hadn’t thought about the marketing aspect of this. And some of those galaxies are really far away — we’ll need to start sending those clever slogans pretty soon. That was humungously hilarious:-) May be the earth had a gut feeling that the Homo sapiens would eventually make their presence felt and that it was the cosmically wise thing to at least separate them for sometime . Well, not very successful ..right? That hasn’t stopped us from messing things up. It’s hard to know how things would have gone if we’d all ended up on the same continent. We’ll have to wait and see. Thanks for the comment, Nadira. Exactly! I could have been to Sicily and back several times over by now! On the other hand, everything in history would have happened some other way. Maybe what we now think of as Sicily would have developed somewhere else — maybe someplace in New England. Or Virginia.